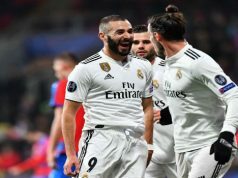 Real Madrid are now just one point behind Atletico Madrid in La Liga after trashing Sevilla at the Santiago Bernabeu thanks to goals from Karim Benzema, Cristiano Ronaldo, Gareth Bale and Jese Rodriguez. 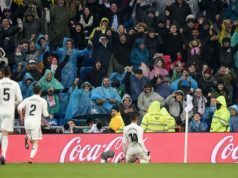 Keylor Navas saved his team with a superb performances and Los Blancos ended up sealing the victory in the second half thanks to the BBC. Los Merengues opened the score after six minutes as Bale delivered a super cross into Benzema, who half-volleyed the ball past Rico to make it 1-0. The hosts had the ball in the back of the net again ten minutes later, but the goal was disallowed. Bale poked the ball home from close range, but the flag was raised. However, replays showed that the Welshman was onside. Sevilla had a major chance to level as Varane brought Rami down inside the box and the referee pointed to the spot. Yet, Navas got down to keep out Gameiro’s shot. Real Madrid were in total control of possession, but Sevilla improved in the second half as Reyes came into the field. 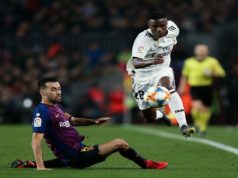 The visitors had a wonderful chance to level as the former Arsenal man fed a low cross into Iborra, but the Spaniard just could not make a telling touch under pressure. Sevilla finally had the ball in the back of the net as Gameiro beat Navas, but the offside flag was raised again. And again, it looked like the striker was onside. In the next play, Los Blancos made it 2-0 as Ronaldo converted a low Danilo cross from close range. And just two minutes later, Bale sealed the victory converting from close range after Benzema had flicked the ball over the advancing Rico. Jese made it 4-0 with a shot from close range after a mix-up inside the Sevilla box. It was a pretty poor defending from the visitors, who had six defenders in their starting lineup but that didn’t prevent Real from enjoying another goal feast.